Courchevel is a community card poker game. It’s in the same family as No-Limit Hold’em and Pot-Limit Omaha, the two most commonly played poker types. However, Courchevel is one of the least known and played poker games out there. The biggest exposure this game got was when PokerStars added it to their selection, both cash games and tournaments. However, it never really caught on. These days it’s still available but you’ll have a hard time finding action at any of the tables. Courchevel was never featured at the World Series of Poker either; not even as a part of a mixed game event, let alone it’s own tournament. When it’s played, however, it’s usually a pot-limit game. Courchevel Hi-Lo is also available on Stars. Each player is given 5 cards face down by the dealer. Then, the first community card – sometimes referred to as “the door card”, borrowing a term from the Stud games – is put in the middle, face-up. The player sitting to the left of the dealer button posts the small blind. Meanwhile, the player sitting left to the small blind posts the big blind. The blinds are mandatory blind raises before the flop to facilitate action in each hand. The player to the left of the BB is the first one to act – this position is often called Under the Gun, or UTG for short. The UTG can either call the blind, fold or raise. If they fold they forfeit the pot but they don’t have to put any more money in the middle either. If they choose to raise, the others need to match the raised amount or fold. Courchevel is almost always played as a pot-limit game, which means the maximum amount you can raise to is what’s in the pot before you make your raise. If there are no callers, the last aggressor claims the pot. After the UTG, the action moves to the left with the same options. If there are at least 2 players in the pot after the first betting round, two more cards are dealt in the middle. The first three community cards – the two new ones dealt and the already exposed one – is what’s called the flop. After the flop another round of betting takes place, starting from the player on the left of the button. Once again, at least two players need to remain in the hand in order for the hand to continue with another community card, the turn. The turn is followed by another betting round – the usual rules apply. The last street is the river – the 5th and last community card is revealed. Then players have the option to bet again. If there are still two players in the hand after the last round of betting, the showdown comes. At showdown, whoever makes the best 5 card hand out of 2 of their 5 hole cards and 3 of the 5 community cards wins the pot. The standard Hold’em hand ranking determines the winner. 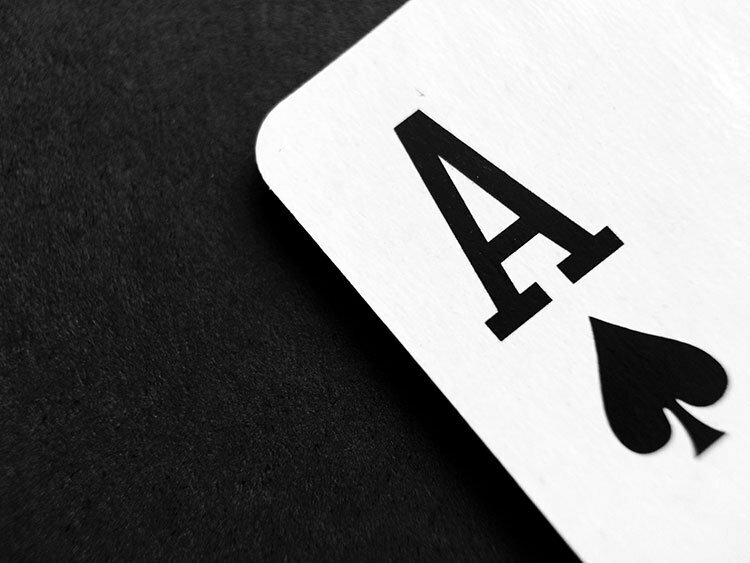 Please note that you have to use exactly 2 out of your 5 hole cards – this means that, for example, if there are four of a suit on the board and you’re holding another card of that suit you do not have flush. This is different from Hold’em. Only the showdown is different in the Hi-Lo version of Courchevel. In this version, the best low hand takes half the pot while the best high hand only takes the other half. The rest of the gameplay is the same as described above. In order to make a low hand you need to have 5 unpaired cards that are 8 or lower – 2 hole cards and 3 community cards, as we discussed. Flushes and straights are discounted and the Ace is low – this is what’s called “the California system” of lowball rules. With that in mind, the nut low hand is . That hand is also a strong high hand (a straight) that can count for both high and low, thus scooping the whole pot. Not every hand has a low pot. If no players have 5 cards that are 8 or lower, the full pot goes to the best high hand. In Courchevel, you have extra information about both your and your opponents’ hands with the door card showing. Use that wisely. For example, if you have suited cards and the door card is of that suit, your hand got more valuable since you’re 3 to a flush with 4 more cards to go. Now you can play more aggressively pre-flop knowing you have a very good draw. If you have a middling pocket pair (let’s say , or ) and the first card on the board is higher, your hand just got devalued. However, at times you know for sure your low pocket pair flopped a set – in this case, you can start building the pot as an equity favorite, evidently. You can also narrow down your opponents’ pre-flop ranges better. If they show strength, think of what kind of cards the board connected with, and use that info to narrow their ranges on later streets as well. Also, keep in mind that everybody’s holding 5 cards in their hands. That means it’s much more likely they make strong hands, thus devaluing what would be a decent holding in other games. Think of middling flush draws on a paired board, or overpairs. Those types of hands might not be worth taking to the next street. Courchevel is named after a high-end ski resort in the French Alps, near the Italian border. According to the urban legend, bored tourists wanted to play a version of poker no-one has ever played before, so they came up with this game. PokerStars started offering it to their users in 2013. It was also available to play on the now defunct Full Tilt poker site. However, as we wrote earlier, it never really caught on. It never made it to the WSOP, not even as part of a mixed game. The place where Courchevel was most commonly played was the Aviation Club de France in Paris. Unfortunately, that casino is now closed. Since it’s not even included in any of the popular mixed games, there are hardly any famous players who are known to play Courchevel regularly. The video we posted earlier was made by a player under the screen name “GodlikeRoy”, a notable online Omaha cash player and a member of PokerStars Team Online. The aforementioned Aviation Club used to hold 1,000 French Franc buy-in Courchevel tournaments. In 1996, it was won by Michel Leibgorin who went on to have a successful live tournament career. In 1999, Michel Abecassis took home the title, another great tourney pro with over $1 million in live cashes to his name. The post Courchevel appeared first on Somuchpoker.